Rialto Pictures has been finding and restoring lost “classics” for ten years. Some are better than others, and I hesitate to use the word “classic” for any but the best of the best of them. But it is thanks in part to Rialto that there are new old movies at the art houses and on DVD. Their latest find is an Italian comedy/drama from 1962. “Classic” may be too strong a word for it, but Mafioso is an entertaining movie, competently made, well acted, and insightfully written. Mafioso is a comedy, although a dose of reality puts a damper on the hijinks at the movie’s end. It’s about a middle manager and efficiency expert at a bustling factory in Milan. Antonio Badalamenti is gregarious, competent, and well liked. After years of service, he’s finally taking a family vacation, returning to his small home town on Sicily. Badalamenti’s good cheer, brought to life by Alberto Sordi (you’ll recognize him from some of Fellini’s earlier films), is the first joy of the movie. The second comes from seeing the stereotypes of Sicilians gleefully confirmed. Back home, his family (and the other villagers) are close-knit, wary of outsiders, but extremely hospitable once you get to know them. There is a small-town code of honor that everyone respects, and if that includes a little Mafia intervention, well, that’s just how things work down here. After all, what do the police have to do with a simple misunderstanding between friends? As Badalamenti reconnects with old friends, his wife Marta tries vainly to win acceptance from her in-laws. The movie drastically changes tone toward the end, when the local Don calls in a favor from Badalamenti, a decade before Marlon Brando introduced Sicilian “favors” to American audiences. 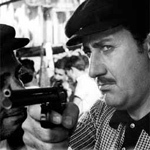 I wish I could connect the two parts of the movie: the light, spry comedy and the deadly serious piece of Mafia business. If there is a moral to the story, it may be that what works in a small, close-knit community does not work so well in a larger world of cities and civilization. If that’s the intended message, it would fit with the rest of the film, because the movie also seems to be “about” its locations. It opens with long dollies and pans across a busy, but orderly factory in an enormous, open building. The camera is awestruck at all the myraid details of a fully functioning plant. When we get to the Sicilian village, we’re in a completely different world, and Lattuada picks it up with the camera. There are no cars, few signs of electricity — there is some bustle, yes, but it is less organized and less focused. Instead of spotless steel, hard corners, suits and ties, and clean-shaven faces, there are rough stone blocks dirt streets, patched clothes, and wrinkled faces. (And when the Don calls in his favor, we visit a third location, introduced with as much fanfare and cinematic awe as the previous locations.) If Michelangelo Antonioni’s films are about architecture and space, then perhaps Alberto Lattuada and Michelangelo Antonioni learned from each other. Boarding the ferry to Sicily, Badalamenti points out to his two young daughters that mainland Italy and the island of Sicily are (at least in 1962) connected by a power line. Ostensibly he’s demonstrating the march of progress, but film audiences may see just how thin that connection is between the time-tested rural life and the fast-paced city life. As different as rural and urban life are, the starkest contrast was in Badalementi himself. He is transformed by his work for the Don. When he returns to his old life, the spring is gone from his step, and his good cheer has been replaced by a polite face put on for the sake of show. At some level he is still the same, decent man he always was, but he has an albatross around his neck that he may never shake. I should mention that the print of the film that I saw is excellent. I can’t quite say that it’s flawless, but that’s just because our print has probably made the rounds before reaching Denver. The restored film offers a rich tonal range (it’s in black and white) and excellent detail. The subtitles were also excellent; in fact, Rialto thanked the translation & subtitle company up-front, offering some definitions for Sicilian slang before the movie, so that American audiences can get up to speed. cynthia altoriso: this film no longer appears to be playing in NYC!! HOW can I get to see this? ?